Fourth of July may be my favorite holiday. Parades and fireworks! What could be better. And there’s nothing like a small town Fourth of July. I loved the Fourth when we lived in small college towns and this year I spent the holiday in a medium-sized city in North Carolina. Greensboro is something over a quarter million people but they still have a July Fourth parade down main street. Greene Street, actually—named for Nathanael Greene, the Revolutionary War general who forced the British troops to leave the Carolinas. The decisive battle was the Battle of Guilford Courthouse in 1781, near what is now Greensboro. Since July 3 was a First Friday, the galleries and artisan shops on Elm Street were open and we walked around and looked at many creative endeavors. One of the places we visited was Elsewhere, an experimental venue of art, music and salvaged art (or junk, if you wish). The Saturday parade featured a few bands, motorcycles and classic cars, fire engines, Uncle Sam on stilts and lots of politicians. Costumed paraders walked along the route tossing candy to the crowd and handing out small flags. My grandsons loved the candy and the fire engines. There was a block party and street festival downtown on both July 3 and 4. Saturday night the Fourth we were invited to a skybox at the stadium to watch the Greensboro Grasshoppers play the Hickory Crawdads. (The Hoppers are a Class A team in the South Atlantic League, and a farm team of the Miami Marlins.) I won’t report the score to avoid embarrassing the Hoppers. The kids were delighted when the team mascot, Guilford Grasshopper, visited our skybox. He took pictures with everyone and gave me a hug. The evening ended with an excellent fireworks display, one of many around town that night. One quiet afternoon the 7-year-old and I went to a screening of Charlie Chaplin’s 1928 film, The Circus, at the aptly named Geeksboro Coffee Cinema. The coffee house caters to gaming geeks and the downstairs cinema shows weekly films. They also have Lawn Chair Movie Nights outside on weekends. Meyer and I and about 20 other film geeks saw Chaplin’s silent film, in which the owner of a traveling circus hires the Little Tramp because he’s accidentally funny. There are all kinds of wonderful sight gags, like a pickpocket sequence, the Tramp locked in a cage with a lion and performing a high wire act beset by five monkeys. 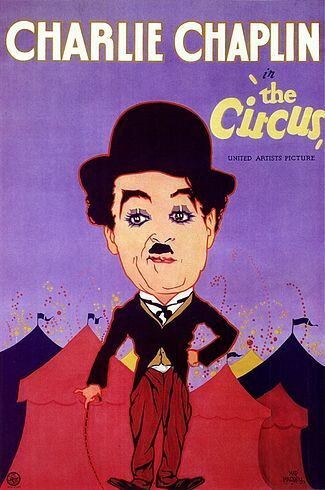 The film ends as the circus pulls up stakes and leaves town. The Little Tramp walks off across the field in a tracking shot framed by an iris lens. Meyer, who just finished first grade and is a great reader, could read all the title cards. He sat on the edge of his seat through most of the 71-minute film. What fun to take a child to such an entertaining old classic and discover it with him! Here’s the lion cage clip from The Circus. I think The General (78 minutes) is the better of the two films. The film (adapted from a book titled The Great Locomotive Chase by William Pittenger) is set in the South during the Civil War and Keaton is Johnnie Gray, a railroad engineer in love with Annabelle Lee. He wants to enlist, but is rejected, and ends up being a daring hero as the engineer of the Confederate train (titled General) that helps prevent the Northern Army’s supply trains from advancing into the South. The film has lots of amazing footage that was carried out in real time, including the train chase and a scene where a bridge collapses and one train falls into the gorge below. It was a very expensive film to produce and Keaton’s career suffered as a result. Keaton is always calm, serious and practical about the situation he’s in, even while he’s performing amazing physical feats as he keeps the General running, finding wood, chopping it and tossing it into the firebox. He doesn’t mug for the camera or overact as most silent film stars (including Chaplin) did. Keaton’s deadpan expression earned him the nickname The Great Stone Face. In the last 15 minutes of the film, however, it was pretty horrifying to realize that I was cheering for Johnnie Gray and the South, especially when the Southern troops appeared carrying the Confederate battle flag. You can watch The General in full online, probably because Keaton let the copyright expire and it became public domain. Here’s a classic Keaton scene from his 1920 short film, The Scarecrow, in which dining is an efficiency exercise. 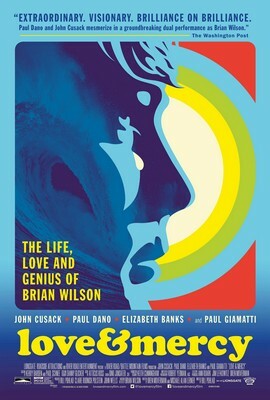 This Brian Wilson biopic is an excellent film that shows Wilson at two different times of his life, played by two different actors. Paul Dano is Wilson as a young man, frontman for the Beach Boys and orchestrator of Pet Sounds. The older Wilson, ~30 years later and suffering from serious emotional problems, is played by John Cusack. The two times of his life are shown seamlessly, with the early scenes paving the way for his later decline. The older Wilson was in such bad shape (“Lonely. Scared. Frightened,” he writes on a card he hands to a young woman he has just met) that he allows himself to be totally controlled by the venal Dr. Eugene Landy, vigorously played by Paul Giamatti. Love & Mercy runs two hours and is showing now at theaters in Chicago and Evanston. I guess I’m an old-fashioned girl. I have always loved fireworks and Fourth of July parades. I spent many years living in small college towns, going to band concerts in the park, watching fireworks in all sorts of venues. I really prefer a small town Fourth, although that’s the only time I prefer anything non-urban. Otherwise, give me a great big city any time. Hi Nancy…. great shot with you and that tall green person…!!! Hope all is well.